Inferno follows Robert Langdon, the professor we first met in Angels & Demons, as he attempts to unravel the latest problem facing mankind. While the plot is similar to the previous Langdon mysteries, the story is unique enough that you don’t feel bored. 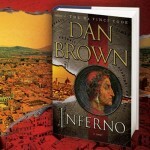 Inferno begins with Professor Langdon in a hospital bed with a serious head injury and memory loss. As expected, Langdon is rarely found without a female sidekick and this book introduces us to child prodigy turned doctor Sienna Brooks. Within a few pages, the chase begins as Sienna helps Langdon escape a trained killer and evade the task force following him. As we follow the duo through every stumble and obstacle placed in their path, we begin to unravel the plot and discover that what we think we know isn’t always the truth. In his international blockbusters The Da Vinci Code, Angels & Demons, and The Lost Symbol, Dan Brown masterfully fused history, art, codes, and symbols. In this riveting new thriller, Brown returns to his element and has crafted his highest-stakes novel to date. In the heart of Italy, Harvard professor of symbology, Robert Langdon, is drawn into a harrowing world centered on one of history’s most enduring and mysterious literary masterpieces... Dante’s Inferno. Against this backdrop, Langdon battles a chilling adversary and grapples with an ingenious riddle that pulls him into a landscape of classic art, secret passageways, and futuristic science. Drawing from Dante’s dark epic poem, Langdon races to find answers and decide whom to trust... before the world is irrevocably altered. While the plot is similar to the previous Langdon mysteries, the story is unique enough that you don't feel bored. Previous story Are You Ready For Football Season?